Cool voice mixer attaches easily to your TV (cable included) and DVD player for just the right vocal blend. Adjustable echo effect for pro vocal sound. Comes with Microphone and AC Adapter. 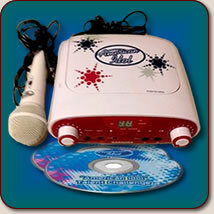 Includes 2 discs, 1 microphone, 1 power supply and one player.